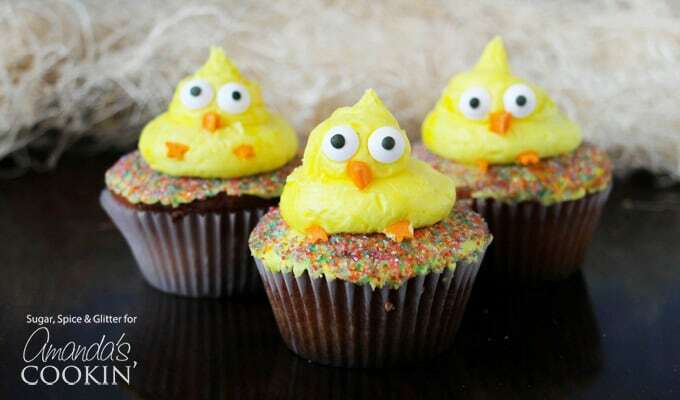 Easter Chick Cupcakes: a fun and easy Easter cupcake design! 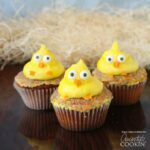 If you’re looking for a quick and easy dessert that you can serve to a crowd for Easter, these cute Easter Chick Cupcakes are a fun little design that you can finish in seconds. They’re easy enough where just about anyone can make their very own adorable Easter chick cupcakes, and wow a crowd- just like these Rice Krispie Nests! I love elaborate cake designs but let’s be honest, that’s when life is peaceful, the kitchen is clean and the kids are all being cooperative. Most of the time, if I have to make a dessert I need something quick and easy – but I don’t want to have to schlep out boring desserts. (I have a reputation to uphold here.) I also love involving my daughter in the baking and decorating, so coming up with something that she can do without me taking over or hovering, that’s a kitchen win! For these cute and easy Easter chick cupcakes, I used my favorite buttermilk cupcake recipe and a vanilla buttercream along with an assortment of candies (and carrots!) that I already had on hand. We’ve done variations of this design throughout the years – rolling the chicks in dyed shredded coconut to give the illusion of feathers, or using mini chocolate chips for smaller eyes. Be creative and find uses for what you already have on hand. I didn’t want to make candy-coated chocolate chips for beaks (not exactly quick and easy), so I cut up a carrot to make small triangular beaks. They also make a cute gift for neighbors or as a treat over coffee with friends. If you want more Easter recipe dessert ideas you may want to hop over and check out this Checkerboard Cake for Easter, the ever delicious Homemade French Silk Pie, these Easter Bunny Cupcakes, this beautiful Carrot Cake Trifle, or even these colorful Frosted Sugar Cookie Bars. Happy baking! 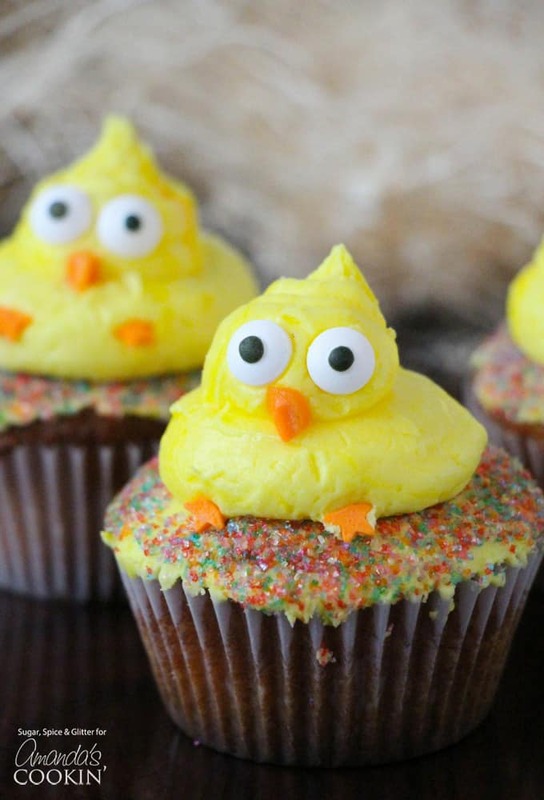 These cute Easter Chick Cupcakes are a quick & easy Easter dessert, fit to feed a crowd! 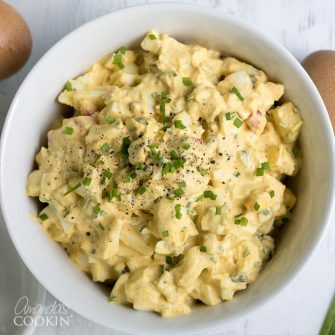 Great for a holiday gathering or as a fun recipe to do with kids. Spread some buttercream on the cupcakes with an offset spatula and roll the cupcakes in your choice of edible glitter or sprinkles. Pipe a big dollop of frosting in the middle of the cupcake, and then a smaller dollop on top to form the chick. Cut the carrots into slices and trim into small triangles for beaks. Break one point off of each star sprinkle to make the claws. Add candy eyes, carrot noses and claws to the chick cupcake. Calorie count does not include candy decorations. This post originally appeared on this blog on Mar 31, 2017.